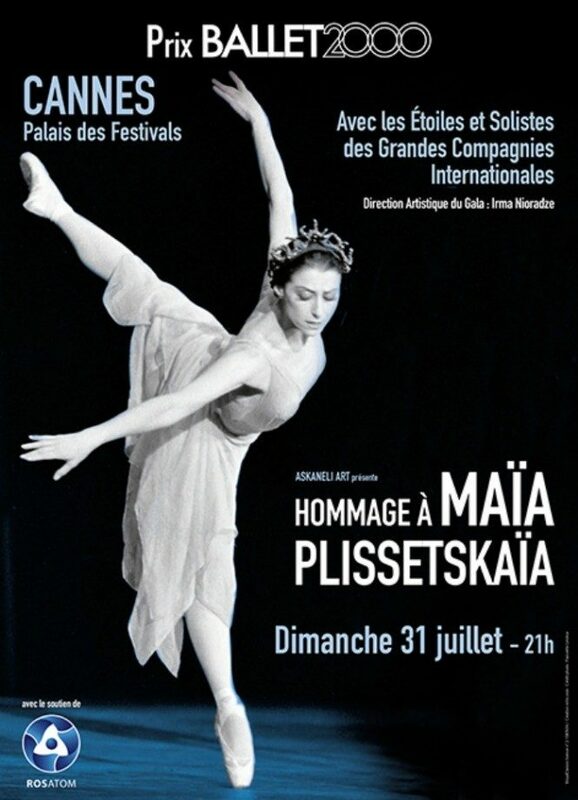 In a week’s time, the BALLET2000 Prix will host its annual event in Cannes, this year dedicated to the memory of Maya Plisetskaya. When the prize was launched, in 2004, then known as Les Étoiles de BALLET2000, the first Lifetime Achievement Award went to Plisetskaya. The 79-year-old not only collected her prize, but danced too: the Ave Maya solo created for her by Maurice Béjart. Her husband, the Russian composer Rodion Schedrin, played the notes of Gounod’s Ave Maria on stage, with cellist Luis Felipe Serrano, while Plisetskaya, elegant, as always, in a costume designed for her by Pierre Cardin, danced simple steps adorned by her magnificent ports de bras as she waved two Japanese-like fans. On the same stage – the Palais des Festivals in Cannes – on 31 July Rodion Schedrin will be guest of honour. Maya Plisetskaya died on 2 May 2015 and later that day Gramilano published a list of tributes from fellow dancers, distraught at her passing. …the inimitable way that this Dutch dance-maker has always managed to contrast classical purity with the adventure of contemporary novelty. There will be three special “MAYA Prizes” this year which will be awarded to Diana Vishneva (Mariinsky, ABT); Aurélie Dupont (Paris Opera Ballet) and Friedemann Vogel (Stuttgart Ballet). 31 July will be her last day as a freelance ballerina as on 1 August she takes up the reigns as Director of the Paris Opera Ballet. Anjara Ballesteros (Ballets de Monte-Carlo, with her partner Lucien Postlewaite). A special award will be given to the all-male group of Armenian dancers known as Forceful Feelings. They are all principals with international companies but are committed to raising an awareness, around the world, of ballet in their country. They will be performing in Cannes with partners of various origins: Sarah-Jane Brodbeck, Arman Grigoryan, Vahe Martirosyan, Arsen Mehrabyan, Galina Mihaylova, Tigran Mikayelyan, Mia Rudic. All the dancers will perform in a gala, organised by Mariinsky étoile Irma Nioradze, at the Palais des Festivals before the Award Ceremony.